You may plan your arrival for early in the day to explore Amsterdam before your cruise. Perhaps take advantage of an Optional Excursion to explore the quintessential Dutch village of Zaanse Schans with its picturesque waterways, windmills, and flower farms. You might consider an Optional Excursion to Holland’s beautiful medieval Muiderslot Castle, or spend free time exploring Amsterdam’s colorful streets, canals, galleries, and shops. Don’t miss the chance to enjoy free time over a glass of Kölsch pale lager—locally brewed for over 100 years! Later, enjoy live entertainment on board. Take advantage of free time instead to explore Boppard’s beautiful forest views—by bike or by foot. Sip a late-morning cup of rich German coffee in a local café after breakfast. Next, enjoy breathtaking views as you cruise through the spectacular Rhine Gorge on your way to Rüdesheim. Sail to a beautiful Main River village while enjoying dinner. Later, enjoy dinner and live entertainment on board. 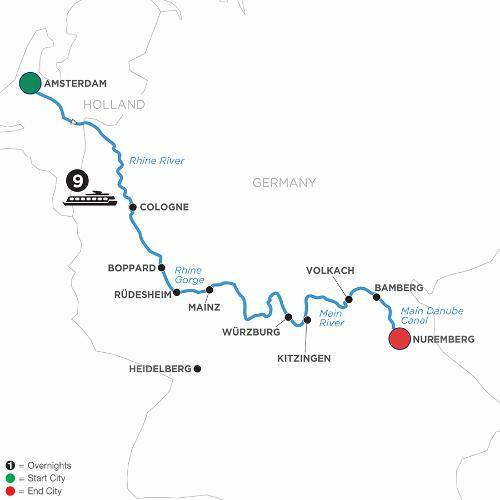 For a grand view of many of the charming and captivating towns in Holland and Germany, you’ll cruise on the Rhine and Main Rivers from Amsterdam to Nuremberg. You’ll experience the color and character of Amsterdam with a guided canal cruise on its iconic waterways, then cruise on the Rhine River to Cologne—a dynamic and historic city with its signature gothic cathedral and soaring twin steeples. Take a guided tour of the city or choose a walking tour of Cologne’s historical Jewish sites. Cruising toward the splendid Rhine Gorge, stop in Boppard with its half-timbered buildings and forest views before arriving in Rüdesheim—flanked by hillside vineyards and Rhine River shores. Visit the marvelous Siegfried’s Mechanical Music Museum for German ditties played by some of its 350 self-playing instruments. Your Rhine River cruise continues with visits to Mainz and Würzburg. In Mainz, take a guided excursion to magnificent Heidelberg Castle, then visit a Main River Village for a picturesque day in Bavaria. Würzburg will delight you with a guided tour of its Old Main Bridge, fortress, and frescoed ceiling of its baroque Bishop’s Residenz along the famed Romantic Road.